Check out the meaning of the name mason/masen, the biblical story of this name and shre your own baby naming story on our forbabycare blog! Naming a child is not an easy task. My husband and I are currently in the process of trying to name our third child, but it seems like nothing sounds just right. Why is it so difficult to pick out a name? It is difficult because it is going to be your child’s identifier for the rest of their life. Teachers, co-workers, and even potential spouses will see or hear their name and immediately make a judgment about them. (I know it sounds incredibly unfair, but it is very true). Opinion: Forced Vaccinations: Should they be allowed? What is the meaning of the name Mason? 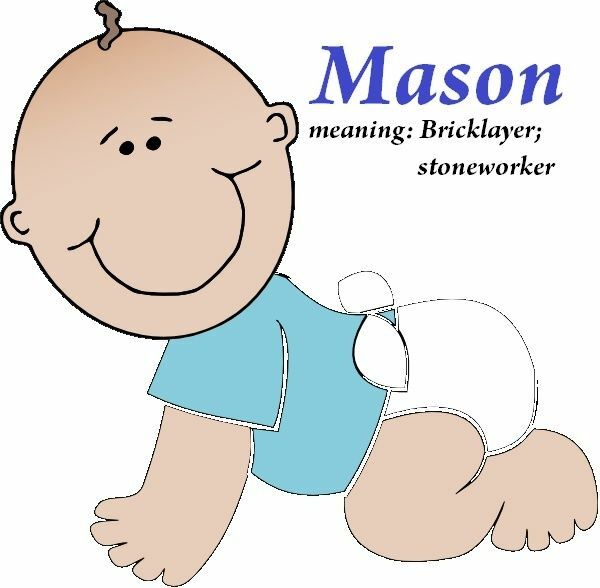 What is the origin of the name Mason? What is the Biblical name of Mason? How popular is the name Mason? That being said, there are no “bad” names or names that are “wrong”. I knew a girl when I was younger that was named “Stormy”. Her mom had gone into labor in the middle of a storm and actually delivered her in the car because due to the terrible weather they couldn’t get to a hospital. For Stormy, her name was her identity and she was very proud of her story. She would tell everyone when they asked about it. Raising your child to be proud of who they are is very important, even more important than giving them a name that you think will set them up for success and acceptance. People pick names for a variety of reasons. Some pick them because they are a family name, some choose them based on someone that they met in their life, and others pick them just because they like them. Knowing the meaning of a name and the story behind it can be a really enlightening piece of information for your child. Enough with this babble, let’s focus on a name that has become very popular in the last few years. Mason. The name Mason, which can also be spelled Masen, is pronounced “May-son”. The word has two meanings, which are “to make” and “stone worker”. Masonry is the noun that refers to stonework. Stone used in masonry include marble, granite, and travertine. Since things that are built in stone are considered strong, Mason can be considered a name to mean strength and durability. 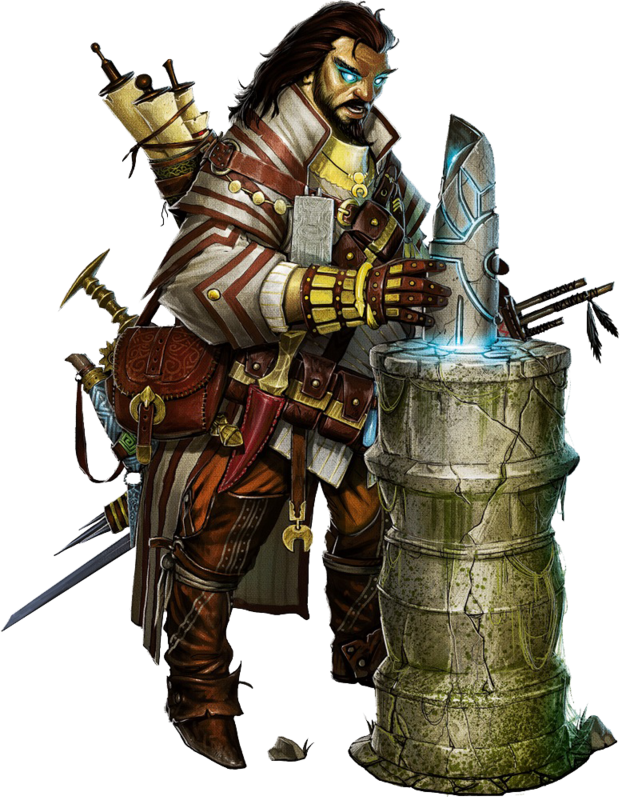 Mason was originally a name in German that was “Macian”. It means “to make”. Later on, the French took the name and translated it to “Macon”. Eventually, the English adopted the name and it became its current form of “Mason”. When the English first used the name, which was around the Middle Ages, it was used as a last name to identify those who worked with stone. In those days, you classified people by their occupation, and an easy identifier was to give them that last name. For example, a baker named Tom would be called Tom Baker. It is unknown when Mason started to become used as a first name. Mason is more commonly used as a boy’s name, but it is also used for girls as well! 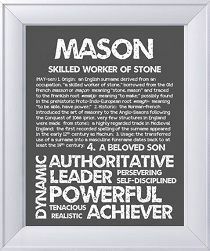 The biblical meaning of Mason is “artificer of stone”. In the Bible, masonry was an art that the Hebrews learned in Egypt. In the Bible, the people of Tyre (which is an ancient Phoenician city) were very skilled in architecture and building things in stone. Hiram, the king of Tyre sent masons and carpenters to build a house for David. Later on, those masons built the Temple at Jerusalem while Solomon was King. Also, masons repaired the Temple during the reigns of kings Josiah and Joash. If you are looking for an uncommon name, do not choose Mason! Since the 1990’s Mason has become a very popular name. Not only is it popular in The United States and Canada, but it is also popular in Australia, Scotland, England. As a matter of fact, in 2011, it was ranked as the second most popular name! Why is Mason such a popular name? One of the reasons is that there are many celebrities that have recently named their children Mason. In 1996, Cub Gooding Jr. named his son Mason. Kortney Kardashian follows suit in 2001 and Melissa Joan Hart too in 2006. Kelsey Grammar named his daughter Mason in 2001. Mason is also a popular name because it goes well with other names very easily. You can use it as a first name or a middle name and pair it with just about anything. Many people tend to pick a middle name to go with Mason that starts with a vowel such as Mason Andrew, but it does pair well with other names like Mason Paul. It is thought of as a more modern name with the traditional sound to it. Pregnancy: 17 weeks pregnant and not showing, is it possible? It can be challenging but also exciting when naming your child. That will be the name that you sing when they are younger, and then scream when they become a teenager. It will become a name that when you hear it called in public, it will make you turn quickly to see if it is your child. If you want to try to see how you like the name, try saying it out loud a few times with the last name included. (The middle name too if you know it!) If it brings a smile to your face, then it’s a keeper. If you have to try to convince yourself to smile, then you may want to think about some other names. Good luck!